In the story of Noah's Ark, a portion of the living world finds sanctuary in a pinch. I thought about this as our rig bounced down the steep track into Ngorongoro Crater, Tanzania. Our descent followed a track cut into the steep tuff walls of the crater. This ark is not made of gofer wood but from the stony shell of a collapsed volcano (see previous post here). The combination of temperature, soil, and water makes the crater a rich grazing land and consequently, one of the most concentrated biospheres in East Africa. I wondered how it might have appeared to a previous generation? The first European to step into this amphitheater was ethnographer/cartographer Oskar Baumann. He was a robust Austrian remembered for mapping areas in what is known today as Rwanda, Burundi, and Tanzania. * In 1888 he traveled through the region in the company of Hans Meyer. Their trek was eventually aborted due to local unrest (in truth, the two were captured, robbed, and had to be ransomed out! ), but just a year later Meyer returned and was the first to summit Mt Kilimanjaro (see our post mentioning Meyer here). 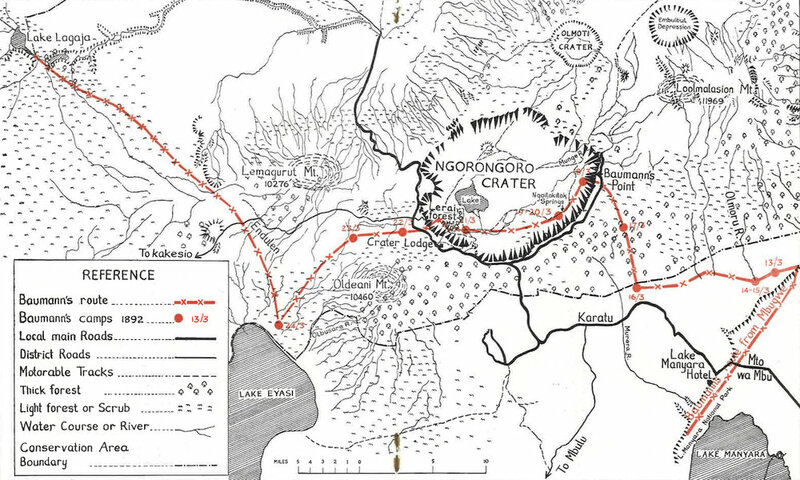 This map shows the route of Oskar Baumann through Ngorongoro Crater. His historic journey was taken 126 years ago this month and is marked in red. The graphic is drawn from a reprint (and translation) of Baumann's journey published as Ngorongoro's First Visitor (1963:10-11). "we entered the Ngorongoro Basin, past a Wandorobo camp whose surroundings were strewn with wild debris around which ravens, marabous (storks), and vultures bickered. We camped in a beautiful acacia forest near the lake. The plain in front of us was populated by numerous rhinoceros, including glorious, snow-white specimens, of which I took one" (Durch Massailand zur Nilquelle [1894: 32]). An unnamed hunter poses with his kill. Image ca.1890 accessed from here on 3/25/2018. Baumann took at least two more rhinos and issues comment on the ease of stalking and hunting these dim-eyed beasts. He paints with matador-like terms. "The rhinoceros is not very shy and if the wind is only half in your favor, you can easily approach to 30 paces without disturbing it. In order to hit a rhinoceros at 30 paces, one need not be an excellent shot; if the bullet smashes its upper body or (with a smaller-caliber rifle) the head, the animal usually falls without further ado. If wounded in another place, it either runs away so quickly that a pursuit seldom succeeds, or it attacks. This moment is usually painted vividly by the Nimrods (= a biblical allusion to "the great hunters"--MZ). Their companions usually run away and only the Nimrod can stop the charging colossus. That sounds very daring but the approaching colossus is nearly blind, one step to the side is enough to make him miss and he races past. He then stops and peers in surprise at the young man, who can then calmly pump a second bullet into his body at close range" (1894:32-33). We pass a herd of wildebeest (Connochaetes taurinus) grazing on the crater floor. A soda lake (Magadi) lies just beyond. We reached the crater floor and Saidi jumped out of his side of the truck to raise the roof. As he was fiddling with the latches I hopped out the other side to pee. He worked his way around and saw me standing there. "There are lions here. You need to stay inside the truck." Then I really had to go. Early explorers and settlers considered lions (Panthera leo) as vermin. Anyone could shoot a lion, even after game laws were created in the 1920s. Remarkably, there is still a lion population in the park, although their numbers are greatly reduced. A warthog (Phacochoerus aethiopicus) trots past our vehicle. According to Oats and Rees (2012:1) the presence of the warthog and the buffalo (Syncerus caffer) on the crater floor are recent developments. The decline of the wildebeest (Connochaetes taurinus) may be a result of disease and vegetation change. The steep decline of the presence of black rhinoceros (Diceros bicornis) is a result of poaching. Finally, the lion population of the crater has suffered due to overhunting and genetic isolation. Two German brothers, Adolph and Friedrich Siedentopf, purchased land on the crater floor in 1899. They attempted to ranch cattle and drive out the wild herds. Thousands of wildebeests (Connochaetes taurinus) were killed in organized shooting parties. Their tongues were cut out and canned. *** The heyday of "African Big Game hunting" had arrived. The Germans established the Northern Highlands Forest Preserve in 1914. This short-lived effort was aimed at watershed protection. 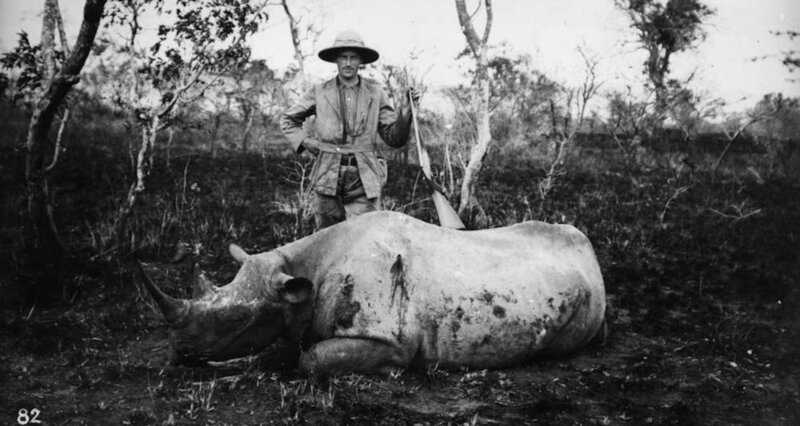 After the First World War the British governed Tanganyika as part of a League of Nations mandate and banned all hunting in Ngorongoro (save for the Siedentopf Ranch). A recent claim suggests that while the German and British efforts were well-intentioned, there was little by way of enforcement; consequently, the impact of these measures was limited (See Rogers [2009: 85]; full text available here). We found a hippo huddle of more than 30 individuals. Real protection for the wildlife would only come after the National Park Ordinance of 1948 that created the Serengeti National Park. Additional protections (as well as concerns) came about as a result of the Ngorongoro Conservation Area Ordinance of 1959. This controversial act separated the Ngorongoro and the Serengeti National Parks, in part, to create greater balance between conservation needs and the developmental needs of local peoples (read Maasai tribesmen). This idea worked better in theory than in practice, and, in the end, was functionally abandoned. The country of Tanzania gained its independence two years later, in 1961. "Ngorongoro Conservation Area is home to a population of some 25,000 large animals, mostly ungulates, alongside the highest density of mammalian predators in Africa including the densest known population of lion (estimated 68 in 1987). The property harbours a range of endangered species, such as the Black Rhino, Wild hunting dog and Golden Cat and 500 species of birds. It also supports one of the largest animal migrations on earth, including over 1 million wildebeest, 72,000 zebras and c. 350,000 Thompson and Grant gazelles" (source here, accessed 3/26/2018). It is a kind of ark, providing a sanctuary for a portion of the living world in a pinch. The tragic part of this story is the slowness with which this was recognized. Only through attentive care can this wondrous place be preserved for future generations. According to Oates and Rees (2012:6), the zebra population in the crater dipped dramatically in the 1970s. It rose slightly in the decades that followed and has been stable since 2005. *Baumann's ethnographical research on the island of Fernando Pó helped earn his PhD from the University of Leipzig in 1888. The subject of Fernando Pó came up a couple of years ago when we were searching for cocoa plants in Ghana. See post here. **Details of Baumann's first trek may be found in his Durch Masailand zur Nilquelle (1894). The German text is available here. An English translation and commentary on a portion of this report was published by the East African Literature Bureau in 1963 under the title Ngorongoro's First Visitor. This rare little gem is hard to find. ***See the annotations in Ngorongor's First Visitor (1963: 12). ****Oates and Rees, "The historical ecology of the large mammal populations of Ngorongoro Crater, Tanzania, east Africa" Mammal Review (2012:3). Text available here. Dr. Mark Ziese, Dean of the School of Bible and Theology at Johnson University, manages the website Bible Land Explorer and teaches regularly in the Biblical heartland. You are invited to join Mark and Vicki for a Mediterranean Cruise aboard the Celebrity Reflection in October, 2018. Onboard lectures will focus on Paul's fourth missionary journey. See the link here for details.